It’s rare that I can say I’ve read every novel an author has published, at least when the author in question has published more than a handful of books. The way I count such things (counting a continuous trilogy as one), Guy Gavriel Kay has published eight and I have read all of them. If you’re not familiar with his career, he debuted with a Tolkien-clone high fantasy trilogy, The Finovar Tapestry and recently wrote a contemporary fantasy with a teenage protagonist, Ysabel. However, he is primarily known for the relatively unique approach he takes in the rest of his work, which I suppose can be summed up as “historical fantasy”. His first novel in this form, Tigana, was content to merely evoke Renaissance Italy while remaining an independent setting and story, but the rest of his books stay very close to history in both setting and events, changing names but never leaving any doubt as to their real analogues. In Under Heaven, the Ninth Dynasty emperor Taizu rules Kitai but the reader is expected to know this is really the Tang Dynasty emperor Xuanzong ruling China. I don’t mean that a knowledge of Chinese history is required to enjoy Under Heaven (if anything the opposite is true), merely that there is no artifice here. Kay is writing about China in the Tang Dynasty but by changing the names he is declaring independence from history. The reason he does this may not be what you expect. When asked why Cryptonomicon refers to “Finux” instead of “Linux”, Neal Stephenson said that if he used the real name Linux experts would jump all over any inaccuracies in the book, no matter how slight. Kay, in contrast, does this because for all his research into the details of day to day life he is interested in explicitly romanticized history, not history as it happened. I’m sure this is not an entirely unique strategy for approaching history, but it’s refreshingly different from our culture’s obsession with demystification. There’s no doubt that the real El Cid was nothing like his analogue in The Lions of Al-Rassan, but Kay’s version is an attempt at exploring what El Cid ought to have been like. At its best, this technique lets Kay turn his considerable talents towards immersing the modern reader in the past and helping them understand why people with different ideals acted the way they did. It doesn’t always work, however, because in making the main characters sympathetic Kay has often resorted to giving them what are, in my view, implausibly modern attitudes. Since Kay doesn’t pull many punches when it comes to how people in the past treated women, the poor, etc. his enlightened protagonists have often struck me as being very out of place. I’m sure there were people in past eras who were ahead of their time in these attitudes, but I need to be sold on why these extraordinary individuals thought so differently from the vast majority. 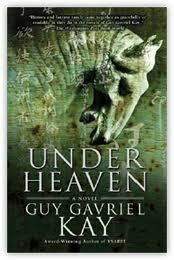 In this respect, Under Heaven is a refinement and improvement on Kay’s past work. The primary protagonist, Shen Tai, is humane and sympathetic but never struck me as a man from another time. He has unusual attitudes, but there is ample justification for these in his backstory and the book’s other characters frequently note this as well. The other viewpoint characters are not developed to the same degree but seemed convincing as products of their society. Additionally, I actually think Kay does something impressive with Shen Tai beyond simply doing a good job making a sympathetic yet realistic character. There’s a common conceit in martial arts stories (and although Under Heaven is mostly a story about characters and societies it isn’t above indulging in a martial arts scene now and then) that the most important attribute of a character is his or her strength of will, and that extraordinarily good and extraordinarily evil people are therefore especially formidable in combat. Kay’s Shen Tai is a character who becomes a formidable man in his society because he is extraordinarily good, and Kay finds a way to make this happen without resorting to cliches. Of the novel’s characters, Shen Tai is not the smartest, most attractive, or the best fighter. However, he is probably the best person of all of them, and Kay shows how this makes him powerful. Not because his inner virtue results in being able to punch harder, but because other people can’t help but respond to his words and actions. And all this is done without making Shen Tai a patronizing saint. Instead he’s just a thoughtful man, better traveled than most, whose experiences have given him a different perspective than his peers. It’s possible that Kay was a little too successful with Shen Tai as a character. Whenever the novel was centered on him, his problems, and his difficult choices, I was captivated. But the novel covers two other storylines in detail. In one, Shen Tai’s sister Li-Mei has adventures on the borders of Kitai and beyond. Unfortunately, though no fault of her own, Shen Li-Mei is an almost entirely passive character who is carted around, sometimes literally, by various people throughout the whole book without ever having any control over her own destiny. Her story gives Kay a chance to lead the reader through the lands beyond Kitai and some other events and locations the main story would otherwise miss, but it never feels integrated with the main narrative. The other story the novel tells is that of the rivalry between the two most powerful officials in the emperor’s court. Unlike Shen Li-Mei’s adventures, this is completely intertwined with Shen Tai’s situation, to the point that it is not immediately obvious this is a different story at all. But in the end, it is this story that dominates that final quarter of the novel. I was not sufficiently versed in Chinese history to know ahead of time, but it turns out than while Shen Tai is invented out of whole cloth, the two feuding ministers and their complicated relationship with the emperor and his favored consort is taken directly from the historical record. Shen Tai is powerful and influential, but he is no match for the emperor and his court, and ultimately he spends the last part of the novel almost as much a spectator as the reader. This unsatisfying conclusion was a deliberate choice by Kay, who is fascinated, almost obsessed, with the way people’s lives are tossed and turned in the tides of history. This has always been present in his fiction, but where it was just a minor theme in Tigana (and part of one of my all-time favorite closing scenes) over the years Kay has emphasized this more and more in his work. When reading Last Light of the Sun I thought Kay’s willingness to periodically stop telling the story and instead rhapsodize in the first person plural on how a small event can change “our” lives was bizarre and annoying. In Under Heaven even more time is spent on asides about chance, fate, and history, but I actually didn’t find it nearly as jarring. In part I might have simply been expecting it, but I think mainly it is just a better fit here thanks to Shen Tai being such an introspective main character. Still, the fact remains that Kay is ultimately less interested in just telling an interesting story with a Tang Dynasty setting and more interested in dramatizing a specific historical event and using that to show how the choices of a few powerful people can change the course of millions of lives. I think Under Heaven was completely successful at what Kay set out to do, but it wasn’t quite the novel I was hoping to read. That’s not to say it isn’t a very good novel. I still think that The Lions of Al-Rassan is Kay’s best work, but I liked this more than any of his other post-Lions novels, a welcome return to form after lesser works like The Sarantine Mosaic and Last Light of the Sun. Great review! I’ve read most of GGK’s novels, and the ones I haven’t are next on the list. Tigana, so far, is my favorite.